If we expect to change the things we don’t like about the system, we have to help make them a lot more palatable than what we have been serving up to the general public. 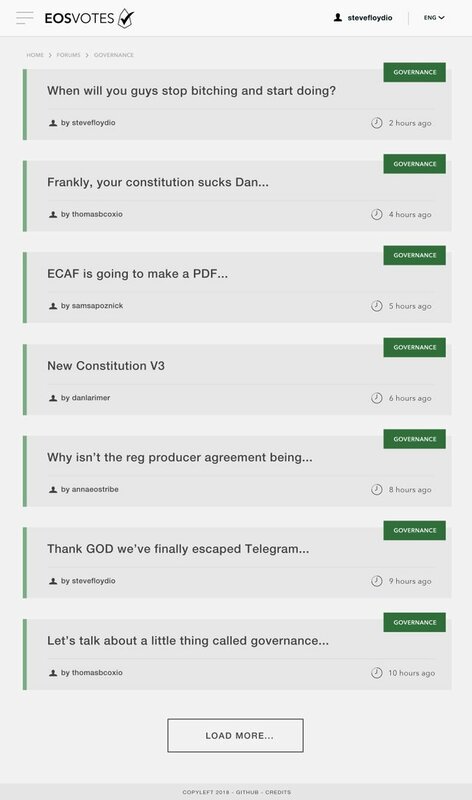 That starts with a user-centered approach to EOS voting. We were only making it harder for our users to interact with the EOS blockchain in a way that would produce the outcomes the ecosystem at large wanted to see. Is there a safe EOS wallet to use? When will a hardware wallet be ready? What do I do to recover my token if they have been phished, lost my key or didn’t register? Only in the last few weeks have some of these questions been answered to the vast majority of token holders. With less than 30% of the total token supply staked, it is pretty obvious we need to focus on answering these questions and providing a neutral place for everyone to come together. But There Are So Many of These Resources, Why The Confusion? I believe it’s a variety of reasons and no one persons fault, but rather all of our fault. There are other factors as well, but those are some of the main areas I think contribute to the current environment. My issue is that creating a dozen different interfaces, conflicting information and the ephemeral nature of the communication channels we are using only compound the confusion for the average token holder, especially at this early phase. We need to keep things as simple as possible and unify our efforts, at least until we have activated more token holders to stake their EOS on the network and have educated them on how the system works. It has been my position for some time that the complexity of EOS is overwhelming to the typical crypto enthusiast. We as a community forget that we might as well be speaking Klingon for the vast majority of token holders, and we should move forward in the coming months with a keen understanding of that in everything we put our time into. 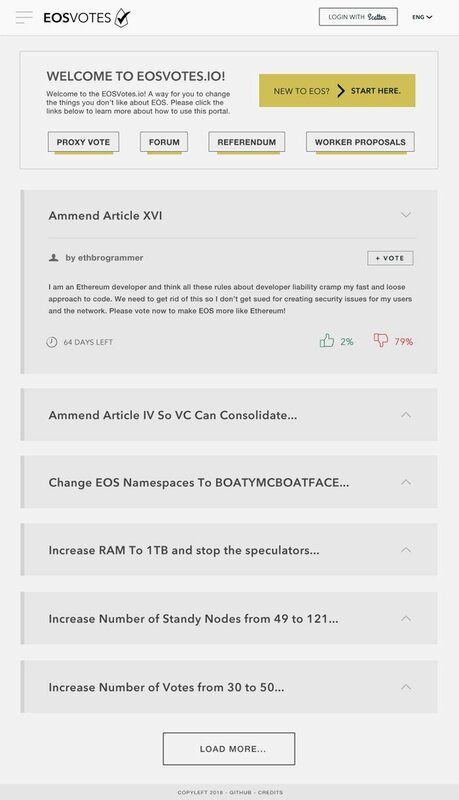 After some thought and a few iterations, I have created a few mockups to share my vision with the EOS community and solicit feedback from all the brilliant minds who have made this chain what it is so far. A simple means for token holders to vote on referendums. A flyout menu that connects all of the components needed to get people to interact with these features. A forum to discuss things that matter to the community on-chain. 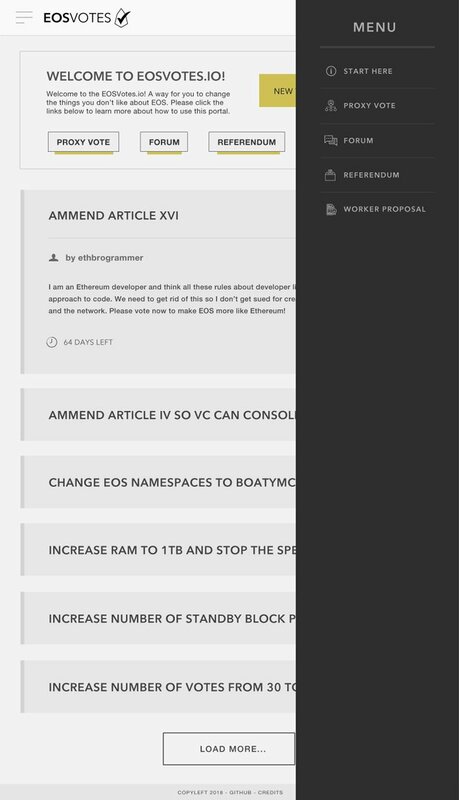 Special thanks to all who have helped build the referendum voting system so EOS Votes could happen. Get all the insider news and resources in your inbox every month or so. You win the internets! Yay!